The older you get the more you realise how much you take your health for granted. The aches and pains creep up on us slowly. I come from a family of long livers (old people as opposed to lengthy internal organs) and the key to longevity would seem to be moderation. Maybe because our parents and grandparents lived through wars and the depression they understand this concept better than we do. For most of us, everything is bigger and better. And our health is suffering as a result. Obesity is a global concern and I just read today that a large majority of us are digging our graves with our own teeth. Gluttony. Yuk...and the fact was only made worse because I was salivating over the blueberry pancakes I had just made when I settled down to read that magazine. That sentence stared out at me with flashing lights screaming, don't eat that, look at me, look at me. I chose the pancake I am ashamed to say....waste is a terrible thing when thousands are starving...oh shush....humour me. It's hard to do the right thing; exercise, eating right, being mellow. However, anyone who has lost their health will tell you that it is more important than money. I am not convinced, but, given I have none of the latter its not an argument I need to entertain. I am pretty healthy I have to say. Thanks to good genes as opposed to a great deal of effort on my part. But I realise you cannot rely on those healthy genes forever. I think I am at the age when body parts start packing it in unless you are careful - bit like a ten year old car. It needs to be serviced more often and there is every chance it could break down when you least expect it. I like to think I am a classic, sturdy BMW (a black one with a soft top) but truth is I am probably more like a Korean shiny wannabe that is cheap to buy and run, looks great on the outside but god knows whats going on inside. Maintaining consistent exercise and eating habits is tough - I am usually all or nothing. This year I want to be the fittest I have ever been. Simply because I owe it to myself. I don't really fancy digging my own grave with my teeth (not after I have spent a fortune over the years lining the pockets of dentists). So this weekend its the start of the Health and Energy Cleanse that goes for 10 days. • Drink plenty of water! • Cut out sugar, salt, vinegar, tobacco, alcohol, caffeine, drugs, and soft drinks. • Eliminate Your Intake of Dairy Products – no milk, cheese, ice-cream, etc. • Drink water before your meals, not during or after. In case you wanted to know apparently the top ten foods are Tomatoes, Broccoli Berries, Soybeans, Tea, Pumpkin, Spinach, Garlic, Pineapple, Apple. I can do all those comfortably. So I am off to the markets tomorrow to get a big stock of fresh fruits and vegetables. My parents are an inspiration when it comes to growing your own vegetables and eating organic food. They grow beans, carrots, spinach, lettuce, onions, corn, tomatoes, potatoes, peppers, pumpkin, cucumber, strawberries, plums, peaches, figs, apricots, squash, lemons, grapes, zucchini, rhubarb. 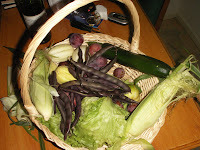 Here is a picture showing a basket of their produce and the photo of the fruit on the right is also from their garden. BUT seeing its my last day of eating carbs and sugar of any kind for at least 10 days, I thought I would edge my way into the cleansing program slowly. 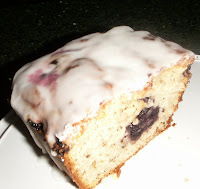 Today I used THE REALLY HEALTHY blueberries (one of the top ten foods) in a couple of gluten free recipes. OK. OK. Tomorrow I start purging those toxins from my body. Today I will enjoy the beautiful blueberries.